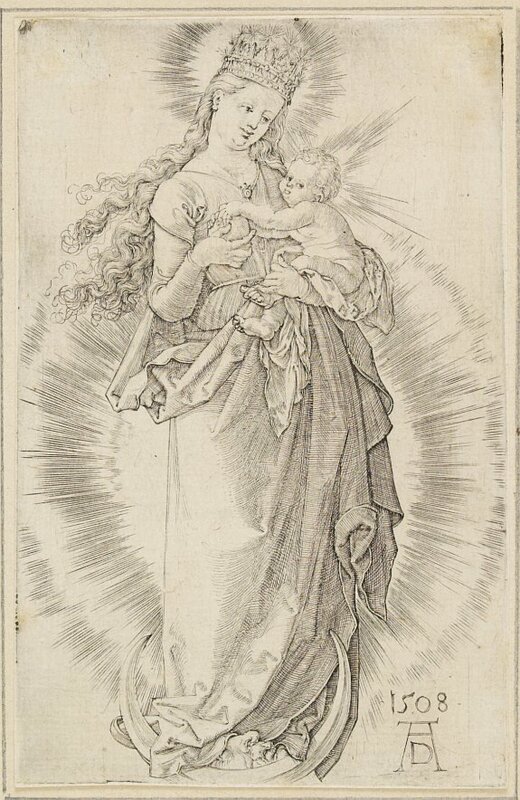 Old map by ALBRECHT DUERER -The crowned Holy Virgin. Title: The crowned Holy Virgin. Size: 4.6 x 3.0 inches. Condition: Cut along neatline. Good impression. Engraving by Albrecht Duerer. Showing the crowned Holy Virgin, within a small mandorla, standing on the crescent moon. On her left arm she is carrying the child Jesus, whose lefthand is holding the apple, as the virgin with her righthand.